IOC Unveils Changes Including Lower Bidding Costs, More Sports At Olympics : The Two-Way The changes adopted today at a two-day meeting in Monaco include a new Olympic channel. They are all part of biggest change in decades to the International Olympic Committee. IOC President Thomas Bach delivers a speech at the start of the 127th International Olympic Committee session in Monaco on Monday. A reduced cost of bidding, a new Olympic channel and a more flexible program that could see the inclusion of new sports — those are among the recommendation approved unanimously today by the International Olympic Committee at its meeting in Monaco. The recommendations are part of IOC President Thomas Bach's 40-point program. 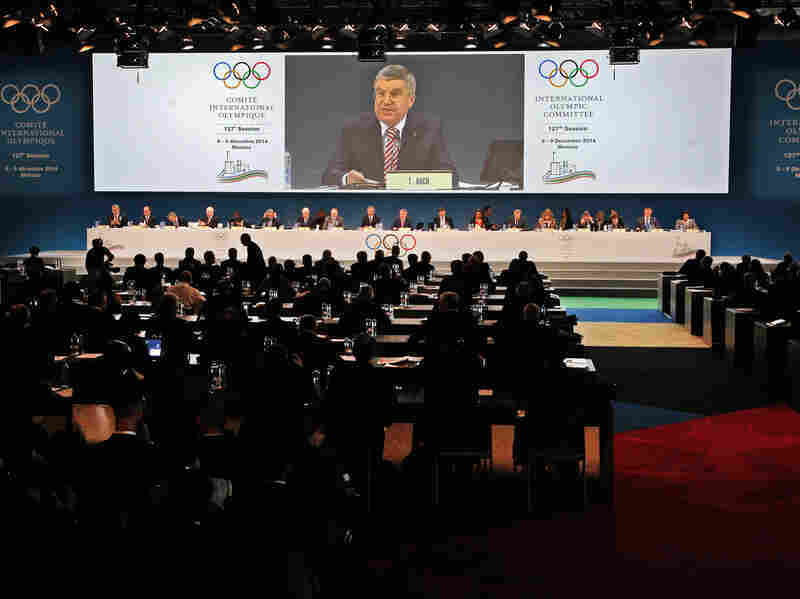 Dubbed the "Olympic Agenda 2020," it's the biggest change in decades to the IOC, the body that runs the Olympic Games. In an attempt to lower the cost of bidding on the games, the IOC said some events will be held in other cities, or countries, raising the possibility of joint bids. Further, the potential hosts will get extra financial help. This comes after Oslo, Stockholm, Krakow and Lviv pulled out of the race to host the 2022 winter games. In the years between the games, the digital Olympic channel will promote Olympic sports. The IOC said it will cost about $600 million over the first seven years. The channel is expected to break even between years seven and 10. Most of the funding will come from the IOC; national Olympic committees will contribute about $89 million each. The IOC also dropped its cap of 28 sports in the games, paving the way for sports such as baseball and squash to make an entry. Instead, the organization said it would limit the games to 10,500 athletes and 310 events. This would likely mean that some existing sports would have to reduce the number of events at the games.